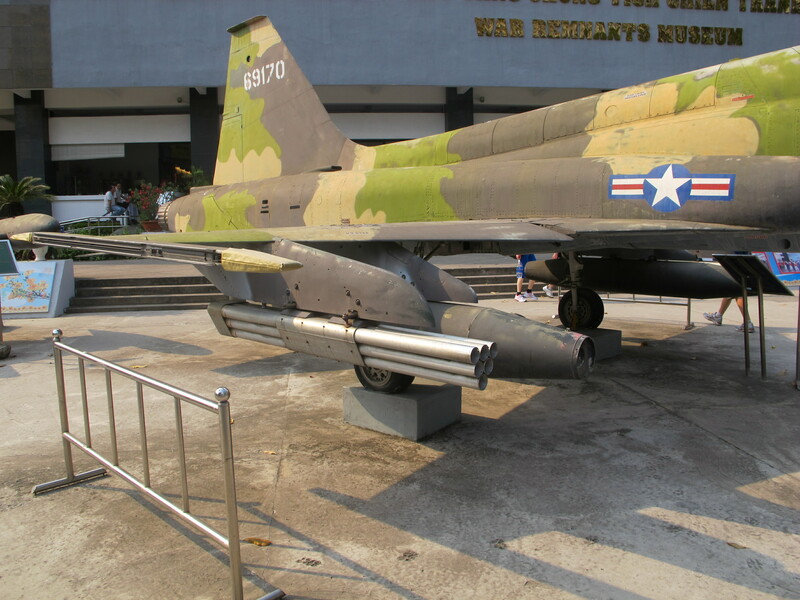 I was recently in Vietnam on business, and took the opportunity to visit both the tunnel complex and small arms display at Củ Chi, and the War Remnants Museum in Ho Chi Minh City proper. With only a half-day to spare, I focused on SALW, ammunition, and ordnance, as well as getting in a little range time. Vietnam still features an astonishing range of materiel left over from the War, and there are some interesting odds and ends on display around the country. The War Remnants Museum (formerly known by the catchy, historically-balanced name “The House for Displaying War Crimes of American Imperialism and the Puppet Government [of South Vietnam]”) contains a wide range of small arms, light weapons, ammunition, and ordnance as used by both sides in the Vietnam War. The courtyard also contains an interesting variety of captured American tanks, APCs, and aircraft. Whilst many of the exhibits are labelled accurately, there are a few that are either inaccurately described, or not labelled at all. I will cover the small arms in another post, however there were a number of interesting ordnance items, in particular an interesting range of cluster bomb submunitions. 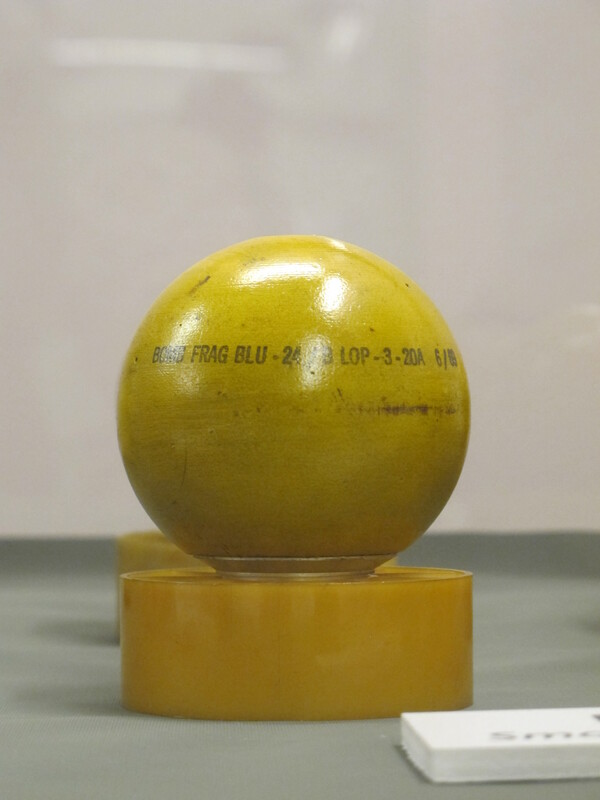 This BLU-24/B submunition was labelled simply as “Bom cam” or ‘smooth orange bomb’. 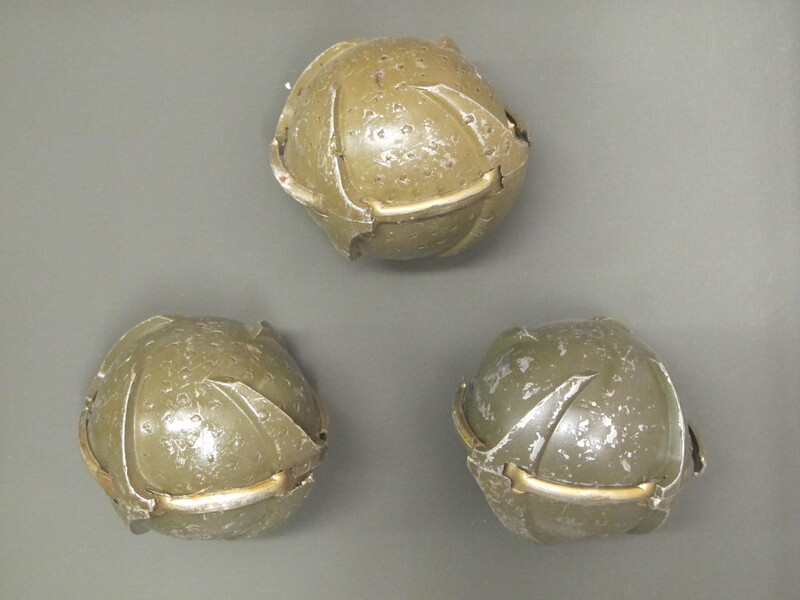 BLU-24/B bomblets are small, cast iron submunitions about the size of a baseball. They are spin-armed, and spin-decay fired; essentially, they arm when they spin fast enough, and detonate when they cease rotating at high speed (i.e. hit something). They are filled with 119 grams of Cyclotol, in this case a 70/30 mix of RDX and TNT. This next, closely related, submunition was labelled as “bom cam khía”, or ‘striated orange bomb’. It is, in fact, a BLU-24C/B jungle/all terrain bomblet. The body of the -24C/B is constructed of grooved, fragmenting cast steel, rather than the cast iron of it’s relative. It weighs about 200g more than the BLU-24/B, and contains 125 grams of Cyclotol. It is also spin-armed and spin-decay fired, however it will also detonate upon contact with water or mud. As you can see, it also features a plastic cover, designed to ensure the aerodynamic stability of the grooved bomb. 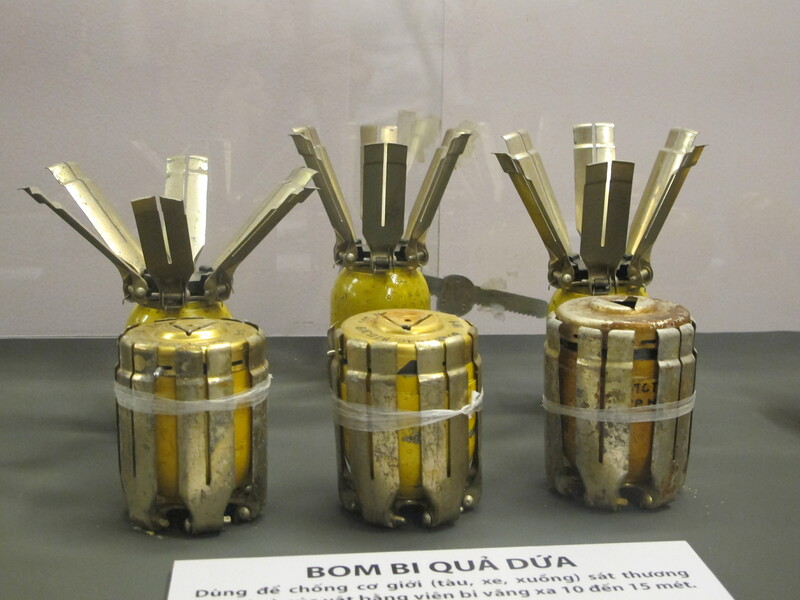 132 of either of these submunitions loaded into a SUU-14A/A dispenser constituted a CBU-25A/A Cluster Bomb. The SUU-14A/A dispenser can be seen in this photo of an F-5/B Freedom Fighter (the pyramidal arrangement of six dispersal tubes). This particular example is marked as a CBU-22A/A, indicating it originally contained 72 BLU-17/B white phosphorous smoke submunitions. Also dispensed from the SUU-14A/A, this is an XM41 gravel mine. A range of gravel mines were employed by the United States during the Vietnam War, as inexpensive APERS mines that could be deployed in large numbers (1500 mines or more) from the SUU-14A/A dispenser. The fabric pouch contains a 16.3g wedge of explosive material (a mix of RDX and lead azide), 30 grams of coarsely ground glass, and two chemical tablets. The lead azide was added to make the mixture more sensitive to impact, enabling the mines to be deployed without a fuse. To enable safe handling, the mines were apparently soaked in Freon 113, and kept at -5°C. This evaporated once the mines were deployed, arming them within 3-8 minutes. The two-tablet system consisted of sodium hydroxide, and was designed to render the mines inert after a given period of time. Having no metal in its construction the XM41 and other gravel mines were undetectable with regular mine detectors. EOD technicians at the time dreaded getting call-outs to deal with Such mines were intended to be part of any ‘Laotian Barrier’ operation. A video showing gravel mines can be seen here. This submunition is a BLU-3/B, occasionally known as a ‘pineapple bomblet’, in reference to its appearance with its stabilising drag vanes deployed. The BLU-3/B is an impact-fired APERS submunition, with an aluminium body containing steel balls for fragmentation. Each bomblet weighs in at 785g, and contains165 grams of RDX. When loaded into an SUU-14A/A dispenser, such as the one shown above, the unit was designated the CBU-14A/A Cluster Bomb. These particular BLU-3/Bs were manufactured in 1966, as part of lot MA-150-96. Finally, we have the BLU-26/B, another US-made APERS fragmentation submunition. 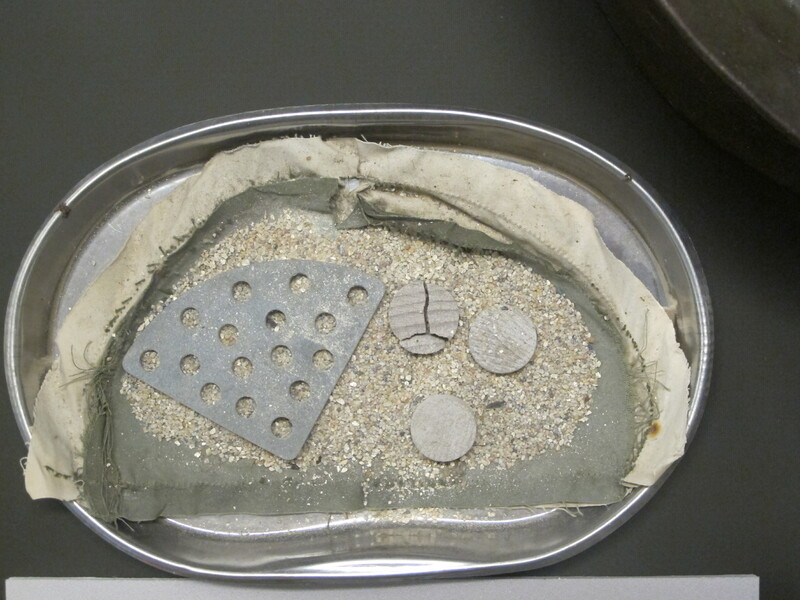 The cases are cast from steel, and the bomblets contain roughly 300 steel balls for fragmentation. They contain 85g of Cyclotol, and are impact-fused. These so-called ‘guava bombs’ are very common, and are still found today throughout Vietnam, Laos, and parts of Cambodia. These were dropped in large numbers during the war; in one sortie, a B-52 could deploy 25, 488 of these. UPDATE 12/03/2012: A BOCN thread by member pzgr40 states that the BLU-3/B is comprised of a casting alloy, ZAMAK, alongside the steel pellets. ZAMAK uses a base metal of zinc, with alloying elements of aluminium, magnesium, and copper. ‘ZAMAK’ is an acronym of the German names for the metal. It is commonly used in automotive parts, as well as some Hi-Point brand firearms. Some information from ORDATA, BOCN, and Jane’s. The SUU-14 (under F-5) is mistakely suspended in a wrong direction! The open ends of tubes must be pointed rearwards, not forward. Can you tell me how many BLU-3/B bombs were loaded into the SUU-14 dispenser? I’m afraid I haven’t been able to find that data. Anyone who knows the answer to this is invited to contact me! I believe there were 19 BLU3s/tube – six tubes per SUU 14 (well CBU 14 in this case) – so 114 in total. (For a CBU 22 there were 12 BLU 17s per tube, 72 in total. For a CBU 25 – mainly used from the autumn of 1970 onwards – there were 132 BLU 24/66 submunitions). Hope that helps……. Actually might well be wrong here – the BLU 24 is 94/95mm,in length as is BLU 3. So if there are 19/tube BLU 3s it would make sense that there are the same number of BLU 24s in a tube. The old Skyraider munitions manual I have is a little vague but it suggests 19/tube 114 in total for BLU 24s in an SUU14. It is not categorical but it is possible websites like http://www.designation-systems.net are incorrect. Very eyeopening look at this, thankyou. SUU-14 on an F5 jet? Any jet for that matter – think more A1-E Skyraider…..
Not to mention the way it’s installed. I get the impression they just assembled something they thought looked about right. There were several misidentified or unidentified exhibits. I was in vietnam 1968-1969. was there any CBU that hit the ground and then bounced up about 3 feet before exploded. Was based In Thailand and spent the first 7 month in country building and loading SUU 13 mine dispensers loaded with thousands of gravel mines. These mines were dropped by day around around fire bases to prevent mass night attacks. Have not been unable to find any Air Force information about this weapon. Can you help with any info.